In this latest video, Lara talks about the recent research on the many benefits of boron. Watch the video below (or read the transcript provided) and let us know what you think in the comments. Hello, I’m Lara Pizzorno the author of “Your Bones” and I’m here today to share some information with you that I hope will help you have healthier bones. As we discussed in our last video clip the trace mineral boron is essential for our bones’ health. We need it because it helps our bones absorb and utilize both magnesium and calcium and it also boosts the activity of our bone-building cells called osteoblasts. In addition to these very helpful effects, boron has been shown in a number of recent papers published in the Review of Medical Literature on PubMed, to have other very helpful effects for our bones. And these new helpful benefits are the topic of this video clip. The citations for these papers are provided below. So what else does boron do for our bones? 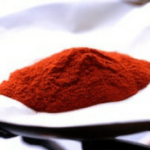 Perhaps most importantly, boron is an anti-inflammatory agent. This is an extremely important beneficial effect because as you may realize by now if you read “Your Bones” virtually anything that causes us to be chronically inflamed, activates osteoclasts and thus increases bone loss. In Europe, boron is prescribed to support the production of cartilage in joints, primarily because of its very significant anti-inflammatory effects. Boron has been prescribed for the treatment of osteoarthritis in Europe, especially in Germany since the early 1970’s. And in some osteoarthritis patients the result of utilizing boron has been the complete resolution of their osteoarthritis symptoms. Several large population-based, clinical studies have specifically shown that levels of a compound called C-Reactive Protein (CRP) which is the marker of inflammation are inversely and independently associated with our total BMD levels. Boron when used in combination with a plant sourced calcium, has been found to significantly reduce blood levels of CRP in humans, this is a huge impact on our bone health. Higher levels of CRP are stronger associated with lower BMD. As I explained, in “Your Bones” from many perspectives – anything that triggers chronic inflammation triggers the over activation of osteoclasts and promotes bone loss. The research evidence suggests that when we lower our C- reactive protein levels we promote bone health by protecting against inflammations’ effect on activating osteoclasts. What else does boron do for our bones? Boron has been shown to protect against what we call “oxidative stress” in animal studies. What’s oxidative stress? It’s a physiological state that occurs when our bodies are kind of overwhelmed by reactive oxygen species or free radicals, you may have heard them called free radicals. And we are not able to neutralize them anymore because we are producing so many of them. So these damaging molecules are then allowed to wreak havoc on whatever tissue they come into contact with, including our bones. And in addition to this, oxidative stress specifically will activate osteoclasts. In animal studies, boron protected animals that were chronically exposed to low levels of a very widely used pesticide called Malathion which causes oxidative stress and get this, it causes oxidative stress at the levels in which it is present in our food supply. 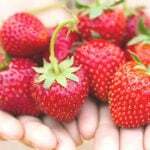 So foods treated with this pesticide are causing oxidative stress in us and they are contributing to bone loss. Malathion not only increases oxidative stress, thus activating osteoclasts, but also causes very damaging changes in the liver, kidney and brain. In animal studies, boron not only decreased malathion- induced oxidative stress but it enhanced the antioxidant defense mechanisms of the animals and actually regenerated damaged tissues in their liver, kidneys and brain. If you read “Your Bones” then you also know that the liver and kidneys are crucially involved in our activation of vitamin D and when it’s not activated properly it doesn’t help us absorb calcium very well. What else does boron do for us? Boron has been shown to specifically promote bone growth in cell culture studies. When osteoblasts are exposed to boron, bone mineralization increases along with an increased expression of a whole group of compounds that are produced when bone-building is going on, including type-1 collagen, osteopontin, bone calin protein , osteocalcin, bone morphogenetic protein, and runix. So all of these expressions their production is increased when boron is around. In a recently published study, supplementation with calcium and boron for just 6 months, improved bone density in 66 out of 100 patients who had osteoporosis. Second to last, boron has been shown to improve brain function. Under really well-controlled dietary conditions, elderly people older men and women were given boron at a level of 3 mg per day and after just 63 days they could see that brain function had increased in these individuals, it had improved. There was a shift in their electrocardiograms (ECGS) towards less activity in the low frequency and higher activity in the higher frequencies, which are the dominant frequencies of the ECGS spectrum. Increased low-frequency activity is associated with reduced performance in psychomotor tasks and decreased high-frequency activity is associated with impaired memory performance. So subjects who were supplemented with boron had improved psychomotor skills of motor speed and dexterity and cognitive processes of attention and short-term memory. There are a number of studies out there now that show boron has beneficial effects on the functions of a number of hormones, not just vitamin D and estrogen, but our thyroid hormones, our insulin, and progesterone – all of which are involved in building healthy bones for us. In studies using female rats whose ovaries had been removed to simulate being postmenopausal women, supplementation with boron improved the animals’ absorption and retention of calcium and magnesium in their bones. The research findings on boron in relation to cancer have been consistently positive. No negative side effects have been seen in relation to boron, in relation to breast, ovarian and prostate cancer. In fact, just the opposite. Population studies have found that an inverse association between dietary boron and prostate, cervical and lung cancers. And cell culture studies have shown that boron actually inhibits the growth of some types of prostate and breast cancer cells. In our next video, we will talk about whether or not boron is safe for people who are breast cancer survivors and those who must take aromatase inhibitors such as Arimidex. Thanks for tuning in! AlgaeCal Plus contains 3 mg of boron in a daily dose (the exact amount that has been shown to improve brain function). This formulation has also been proven to increase bone density…even in 80-year-old women! It not only has boron, but all 12 of the other 13 known essential bone supporting minerals too. 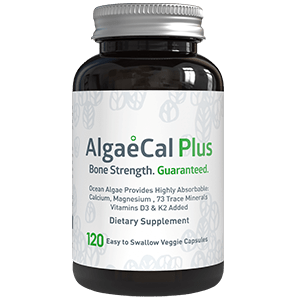 And AlgaeCal Plus contains vitamin D, vitamin K2, and vitamin C.
Clinical studies demonstrate trace minerals like boron are important for bone growth in addition to calcium and magnesium. To learn more about AlgaeCal Plus, click here. You did not talk about the problems of constipation that many of us suffer from when we take calcium; Does your product cause constipation like most calcium supplements do? AlgaeCal doesn’t cause constipation because it’s a naturally occurring, plant source of calcium, and is very well tolerated. Our body actually recognizes it as food like spinach, broccoli, and other leafy greens. The majority of calcium supplements come from rocks, which your body does not recognize as food. This can certainly cause issues with constipation! You can learn more in our blog post on calcium and constipation here.